Despite the Snowden revelations of the extent of official data gathering and storage on individuals, the overwhelming majority of citizens have not only resigned themselves to electronic surveillance but are putting themselves in a position to have their habits examined microscopically by bringing eavesdropping digital assistants into their home and buying “smart” home appliances. Nevertheless, for those of you who care about your civil liberties, a new form of police digital information collection, known as a “reverse location search warrant” have been approved by courts in Maine, Minnesota, North Carolina and Virginia, even though the ACLU contends that these search warrants violate the Fourth Amendment by not being sufficiently specific. The scope of the warrant was so expansive in time and geography that it had the potential to gather data on tens of thousands of Minnesotans. Google’s lengthy user agreement does specify that any data Google keeps may be provided to police in response to a legal demand. But the process by which a user consents to the data collection isn’t always clear…. Apple’s iOS and Google’s Android operating systems collect location information using built-in GPS chips, and by scanning for nearby Wi-Fi networks, cell towers, and Bluetooth signals to build a crowdsourced database of location information to help the devices quickly figure out where they are. But while Apple’s location data processing is anonymous, two hard-to-find settings— “Location History” and “Web and App Activity” — allow Google to keep track of everything their users search, and everywhere they go. It affects all Android users, and iPhone or iPad users with apps like Google Maps installed on their device. So if you have downloaded Google Maps (and Lord only knows what other apps), being on an Apple device won’t protect you. Given how specific cell phone location data is (both the GPS location and the time stamping), the willingness of judges to sign off on search warrants that go well beyond the immediate time and site of a crime is troubling. Outside of concerns around government overreach, the FBI’s remarkable attempt to force Google to assist in its investigation will likely worry all who were disturbed by an Associated Press investigation published on Monday that claimed Google continued to track people even when they turned location features off. The court warrants unearthed by Forbes indicate some at the FBI believe they have a right to that location data too, even if it belongs to innocents who might be unwittingly caught up in invasive government surveillance. And the government feels such fishing expeditions are permissable; it issued the warrant on Google without knowing whether or not the suspect used an Android device or any of the company services at all…. What made the Maine data request unique was its complexity and breadth, asking Google to carry out significant work to find people who’d been in two locations, across multiple locations at specifc times, all in a single warrant. We’ll return to Google’s actions later in this post. The most recent order on Google, unearthed by Forbes earlier this week, came from the FBI in Henrico, Virginia. They went to Google after four separate robberies in which unidentified, armed individuals entered and stole from the same Dollar Tree store between March and September this year. The manager of the Dollar Tree was also robbed at gunpoint while dropping off money at a Wells Fargo night-deposit box located just down the road from the store. The warrant asks for location histories held by Google for anyone within three separate areas—including regions around the Dollar Tree store and the Wells Fargo address—during the times and days the five robberies took place. The FBI also wanted identifying information of Google account holders in those areas, two of which had a 375-meter radius. The other had a 300-meter radius. Google Maps shows that a significant number of residences, shops and restaurants are within the zones outlined in the warrant. Now at least in the Virginia case, the images above were part of the warrant. But that isn’t a given. But the judge wasn’t given a map. The judge approved the warrant application in about 10 minutes. “Most human beings can’t interpret large strings of numbers and GPS coordinates without a map to illustrate them, and judges are no exception,” said Nathan Freed Wessler, an attorney for the national American Civil Liberties Union. There was a match, but not a great one. Police said it was near the gas station, but not the bar or hair salon, and the data point wasn’t very accurate. “Google locations and their accuracies should not be used in a definite way,” read a study from a team of forensic data scientists last year. The research found that while Google’s data could usually place someone in the general whereabouts of an area, some conditions resulted in Google overestimating its accuracy 93 percent of the time. 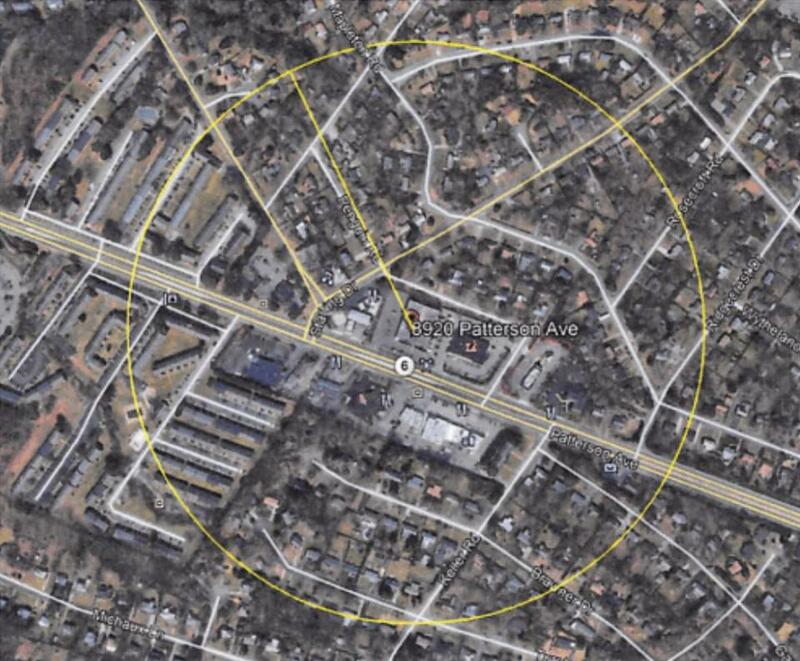 In this case, Google told police the device was “within a 52 meter radius,” roughly 170 feet, of the gas station. With that large a circle, a judge would have no way to know for sure if the device was the burglar, someone buying fuel, the business owner’s phone or tablet kept inside, or someone just driving down the road. Still, the device was spotted at 2:29 a.m. and 2:54 a.m., while the burglary was at 2:47 a.m. It presented a tough probable cause analysis, and police were asking for a lot: the identity of the phone’s owner, billing information, phone numbers, and two months’ of their web browsing history and location data. Google was also put under a non-disclosure order, restricted from telling the user that this information would be divulged for at least six months. No map was provided in the application to illustrate the area or accuracy level to the judge. This warrant was also issued within about 10 minutes of the detective requesting it. Two months after Google turned over the data, no one has been arrested. Brooklyn Park has also tapped Google for location data. While the company rejected some early versions of the police department’s warrants when they didn’t agree with the language, “they’ve been really good to work with,” said Mark Bruley, the city’s deputy police chief. That wasn’t what happened in the Virginia or Maine cases. In both the warrants were issued by Federal judges, and Google just blew them off. It didn’t respond at all. In Maine, the court extended the warrant date four times, and was prepared to do so a fifth time, but the prosecutors gave up. I find this part of the story as troubling as the warrants themselves. Google deifies the court multiple times, with no consequences? At a minimum, a Google executive should have been required to show up to ‘spain himself. These incidents make clear that Google is a law unto itself. The experts are forcefully of the view that these reverse location search warrants aren’t kosher. Among other reasons, they fail to establish probable cause. The police can’t establish that the perp was carrying a device that was sending data to Google at the time of the crime. Jennifer Lynch, senior staff attorney at digital and human rights body the Electronic Frontier Foundation, said that the order in Hernico [Virginia] could’ve swept up the locations of thousands of innocent people. “Requests like this act as ‘general warrants’ and may violate the Fourth Amendment because they are not tied to a specific device,” Lynch added. The Fourth Amendment provides Americans with a right to protect themselves from unreasonable searches. [Jonathan] Jones, the Elon professor and former Durham prosecutor, expressed similar concerns after reviewing the warrants. In particular, the fire and sexual battery cases didn’t present evidence that the arsonist or the attacker had a cell phone, he said. “I don’t think with real scrutiny that they would hold up,” Lacambra said. She also singled out the possible arson and sexual battery warrants, pointing out that the affidavits fail to link devices with the crimes. “To just say, ‘Criminals commit crimes, and we know that most people have cell phones,’ that should not be enough to get the geo-location on anyone that happened to be in the vicinity of a particular incident during a particular time,” Lacambra said. Don Gemberling, an attorney who managed data practices issues at the Minnesota Department of Administration for more than 30 years, pointed to another consequence of these data sweeps: once the investigation is closed, all the data law enforcement collects become public information. “That’s probably something that we’re going to have to navigate in the near future,” said Bruley. He said all the data are saved as part of case files. 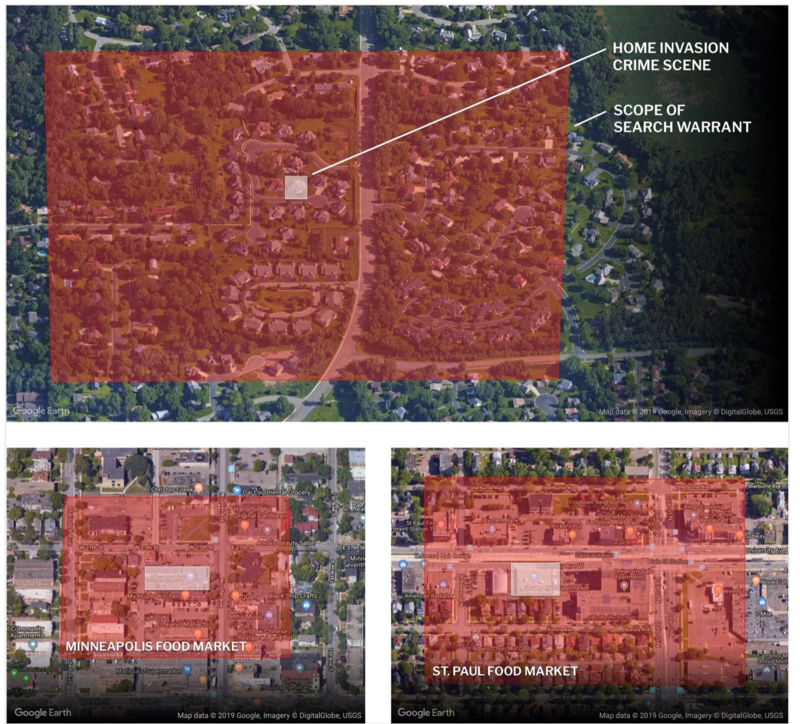 Captain John Sherwin of the Rochester Police Department in Minnesota said it wasn’t just Google that could furnish cops with a startling mount of detailed location data. Facebook and Snapchat were two others who’d proven useful, he said. Sherwin told Forbes his homicide investigators recently served a court order on Snapchat to help it locate an alleged shooter pursuant to court order. Though not a reverse location search, the Rochester police used the Snapchat data and combined that with information from the person’s internet provider to determine the location of the alleged killer’s IP address, Sherwin said. Combined with “general intelligence” from friends and associates, police were able to locate the suspect. When Google provides location data in response to one of these warrants, police “put that location data into the software and then map out a ‘profile of life’ of where they go, where they travel, and where they were the night of the crime,” [Mark] Bruley [Brooklyn Park deputy police chief] said. Most readers seem to have resigned themselves to being geolocated all the time. Maybe this story will encourage you to think twice about that. This entry was posted in Banana republic, Legal, Surveillance state, Technology and innovation on February 12, 2019 by Yves Smith.